A fantastic bunch of 16 new young people were welcomed on to the TYLA programme (Central West) this September. We kicked off with our Values Camp which is an induction to the TYLA Values and programme. The camp was filled with exciting adventures and workshops aimed at introducing the TYLA Values - all 16 participants had a great time and wished they could stay longer on camp! Activities included river crossing, bush hiking, Waiwera hot pools and snorkelling - none of the participants had ever tried putting on a wetsuit before and so this proved to be a fun activity! Thanks to Pete, Lino and Leon - our fabulous volunteers! 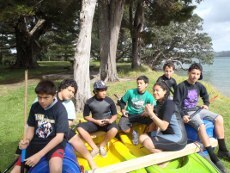 Thanks also to the staff at YMCA Waiwera who always make our camps fantastic! And definitely a big shout out to the young people on camp - you were awesome!